Have you ever seen an old-fashioned braided rug? If so, then you know that their character alone is enough to make you feel warm and cozy! Invented back in the days when store-bought rugs simply weren’t an option, braided rugs became a standard in farmhouses everywhere. 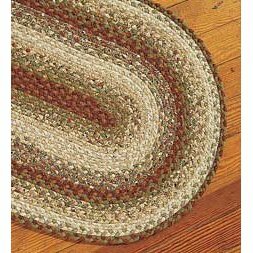 But nowadays, braided rugs have made a come-back as people are trying to re-create that warmth and feel of an old farmhouse. These great rugs are generally made in three shapes, ovals (the most popular), circles and squares. In addition, they are usually made with certain color patterns. For example, a blue and white oval braided rug is a common sight. 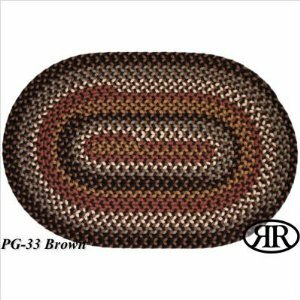 Where do you use braided rugs? You could place a circular braided rug under an old wooden dining room table and create a country farmhouse look, or place a smaller oval rug in front of a fireplace. In addition, can you imagine a large square braided rug done in soft pastel colors in a baby’s room? Wouldn’t it look comforting and quaint? Another great feature of these rugs is that, unlike many other area rugs, they won’t curl up at the edges. These rugs are made of heavy-duty materials, but are made in such a way that they will lay flat and low to the ground. So, if you are looking for just that perfect accent to add warmth and a bit of character to your room’s décor, maybe you should consider a braided rug!